A millennia of Italian winemaking tradition and skill in every sip. Borgo Antico means “ancient village” in Italian, and indeed it is. The town of Borgonato is mentioned in imperial documents dating back as far as 879 AD, but winemaking in this region is documented far older than that. 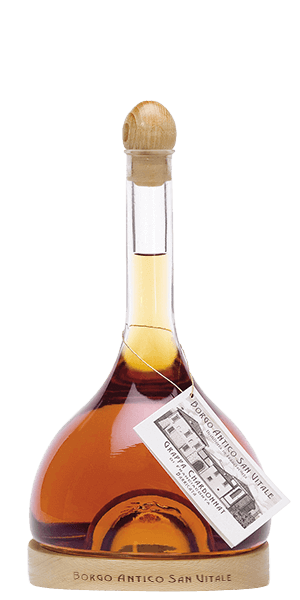 Compared to this, Grappa is relatively young; it has only been around for a hundred years or so. The Borgo Antico San Vitale Distillery has been recently constructed within the old ruins of the church of San Vitale. They are building on years of tradition and history to produce a solid range of Grappas distilled in classic, copper, alembic stills. Borgo Antico Chardonnay Barricata Grappa comes from the Franciacorta region nearby. It is made from 100% Chardonnay grape and rested in small, new oak casks until mature. The bottles are filled at a 40% ABV. While most Grappa is nearly clear, you will notice a darker color consistent with maturation in the oak. The word “Barricata” comes from the word “barriques” which means small new oak casks used to age certain wines and spirits. The smaller size increases the ration of spirit to wood contact. What does Borgo Antico Chardonnay Barricata Grappa taste like? The Flavor Spiral™ shows the most common flavors that you'll taste in Borgo Antico Chardonnay Barricata Grappa and gives you a chance to have a taste of it before actually tasting it.